Winner of the Gold Award for Best Mobile/Handheld Game at the 2009 Rose Design Awards, Matmi New Media’s Monster Pinball, is the most beautiful pinball game you will ever play. The game is Matmi’s first entry into the mobile gaming market. And what an entry it is! Aside from the amazing image and sound quality, the game is so far removed from retro pinball games like Williams that it’s in a class of its own. 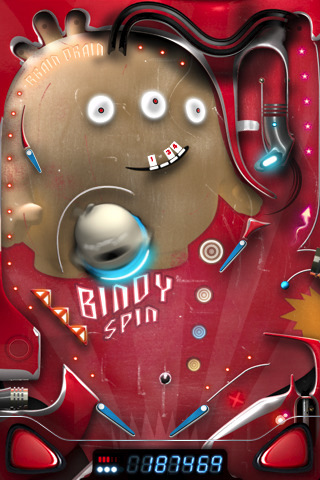 Monster Pinball loads quickly and has several amazing features. There are six unique, linked tables that you move through as you play: Invade, The Hole, Headbanger, Mutator, Hogie Feed, and Brain Drain. The best part is that you won’t waste time scrolling through the different tables. There are also multiple flippers located everywhere as well as rebounds, stallballs, boosts, bonuses, and freeballs. The hotball feature is a nice touch and allows users to score double points until they die. Monster really utilizes the iPod’s accelerometer well by having highly responsive tilt capability. In addition, the 60 frames per second physics engine ensures a smooth and realistic gameplay. Users can also pause, save, and resume the game as they would with other pinball video games. After losing their last lifeball, users can submit their score to local and online scoreboards and even Facebook Connect. Just know that the default high scores are nothing compared to the global ones. Those who’ve been deprived of pinball their entire lives will be absolutely stunned by this game. If you’re one of them, see the help section on the start page. It shows you the basic location of the plunger (what you use to launch the ball), left and right flippers (what you’ll use to hit the ball), tilt warnings, and life ball amount. Hit “More” and you’ll see Bindy’s notes on freeballs, hotballs, the tilt feature, and how points are multiplied. This game is highly intuitive and easy to play. Users just launch the ball and hit it with the big red right/left flippers. Try not to let the ball fall through when you’re at “Invade” or “Brain Drain” or you could lose a lifeball. And don’t let its ease mislead you or detract you from buying the game. Monster Pinball is highly addictive and worthy of the hundreds of hours a user might spend on it. Although Monster is the best pinball game out there, it might benefit from a few tweaks. For instance, when the double score message appears, it blocks part of the screen and hinders your view of the ball. This annoyance has caused me to lose too many balls to count. A fix to this problem could be reserving a space just for messages, creating a noise alert or message, or making the message transparent altogether. Secondly, more tables could be added to provide a change of scenery. I’d also like to see additional secrets I could unlock. And if there are secrets, hints and tips on unlocking them would be very much appreciated. Monster Pinball has as many bells and whistles as a slot machine. Once you download it, this game will have a permanent place on the first page of your iPhone. At the low price of $3.99, it’s a steal. AppSafari review of Monster Pinball was written by Linda Ta on March 15th, 2010 and categorized under Action, App Store, Featured, Fun, Games. Page viewed 4679 times, 1 so far today. Need help on using these apps? Please read the Help Page.